My first challah -- oops! Something about the holiday season and the general prettiness of them gave me a hankering to try my hand at challah bread. Mind you, I don't think I've had it since childhood, but I remember a golden, shreddable crumb under a toothsome crust. TFL is loaded with all kinds of challah recipes and I finally decided upon zolablue's sourdough spin on Maggie Glezer's recipe, which seemed accessible enough for a relatively new baker and an absolute beginner when it comes to challah. Starting the morning before, 8g of my 100% rye starter got transformed into 35g of stiff white starter. Early that evening, the 200g of stiff levain got made. Never made a stiff levain before, it was extremely neat and tidy. It was supposed to ferment at room temperature overnight, but knowing that I needed to be out in the morning, I left it out until about 3:00am and then stuck it in the fridge to slow things down. Possibly mistake number one. The next morning, the levain was taken out of the fridge to continue at room temperature while I went about my business. When I came back to it in the early afternoon, it had about tripled and was full of bubbles, so I mixed up the dough. Except, never one to leave well enough alone, I decided that I wanted to add in some grated orange zest and ground coriander. And that, while I was at it, to use orange juice in place of the water. Probably mistake number two. The recipe says to knead the dough for no more than 10 minutes. Tu parles! I had a shaggy, wet, sticky (but very fragrant) mass that needed about an hour of SLAFs to come together. Not a happy puppy. Well, it did finally -- sort of -- come together, and I let it rest for a couple of hours. Came the time to shape, dividing the dough in two, then each half into six pieces and rolling them out to ropes. I don't think I found a "best way" to do them until about the sixth rope, by which time I was beginning to worry about the remaining dough drying out, despite the cloth covering them. So the next batch of rope was of a slightly fatter caliber (in retrospect, that made for a plumper loaf, which I preferred). Braiding was the easiest (and thus my favorite) part. Egg wash and rest. Recipe called for five hours, till tripled. Well, it was already 10:00 pm. Five hours would have meant baking at 3:00 and probably not getting to bed before 4. Hmm. I dithered about it briefly and was too nervous about retarding the loaves, since I have no idea what an enriched dough does when it's put to sleep. So I stuck it out, waited four and a half hours, gave the braids a poke and decided to preheat the oven. They hadn't tripled, but they weren't bouncing back at all quickly, so I thought it would be better to bake them under- rather than over-proofed. More egg wash, sprinkle on poppy seeds, into the oven for about half an hour. They smelled wonderful, and as I peered through the oven door, I was relieved to see that none of the braiding had torn. And out of the oven they came. Not as zaftig as I'd hoped, but not the puddle I had feared, either. I cut it open this morning and was surprised by the crumb. Not shreddable, not golden! Harrumph. But wonderful as toast, with a taste of childhood. I will most definitely be trying this again, especially if I can avoid the sticky, wet phase that this bake went through. did I set myself up for trouble by using orange juice in place of dough water? Is that what gave me the stickies? could the braided loaves indeed have been refrigerated overnight? should challah have a more open crumb than this? can any bread be braided? can I take a favorite lean loaf and bypass all the preshape/shape/score angst and just braid? If so, how should the buk/proof timings or methods change? Any and all feedback are welcome, as always. most of your questions but I am pretty sure that you could have retarded them. I do a sticky roll with sweet dough that I put into the fridge overnight to rise and bake in the morning. They are actually nicer than without retarding them. It's good to know I can just chuck them in the fridge and get some sleep. And if they're even better that way, it's a win-win! Carole, they are wonderful. Some of the best Challah I've seen. Such a rich colour, they've kept their braids and perfect crumb. Deserving to be the centerpiece of any Shabbat table. P.s. to answer your question... That is a perfect crumb. Challah, being an enriched dough, has more of a cakey crumb. One wouldn't see a very open crumb like many of the sourdough we see. 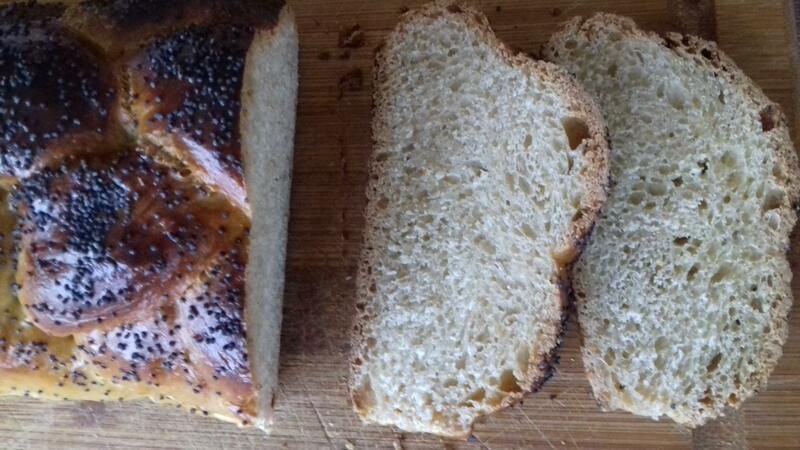 Poppy seeds are traditional on Challah but so are sesame seeds. I like both but sesame seeds adds extra flavour too. Very kind of you to say so. I wasn't looking for open crumb, but maybe something a little more shreddy? But if you say this is good, I'm not gonna argue. I did, for one mad moment, consider tossing sesame seeds into the dough. Will give it a shot next time. I love their taste too. 4. Challah should not have a more open crumb. The crumb of a nice challah is almost like Hokkaido milk bread, but not quite. It's due to the egg and oil (in challah), milk, (egg) and fat in Hokkaido w tangzhong. 5. Cannot answer. I would think a lean bread would be less friendly to being braided, b/c there's no enriched softness and to braid you really have to degas a bit...... Just my 2 cents. 1. I think, for the fright that I gave myself, the orange juice doesn't really come through enough to warrant an hour of slap and folds. Maybe next time double up on the zest and skip the juice. I also saw something in a shop that looked interesting: powdered orange zest? 4. That is exactly the comparison I was groping for; I was wrong to talk about open crumb -- it's that milk-bread looking crumb that my mind's eye remembers. So this crumb is from all the slapping and folding? 5. Yes, I suspect you're right. I would imagine it would need at least some oil to make it workable. Fiddle dee-dee. I'm gonna give it another shot soon 😊. Thanks for the two cents, worth their weight in gold! The first link is interesting because I was also wondering if I could use part whole wheat; it would seem that I can try. Six eggs does sound like a bit of a cholesterol bomb though! The second link is the recipe I tried. See where it says that dough should be kneaded for no more than 10 minutes? Ha! Thanks again -- now go to bed!